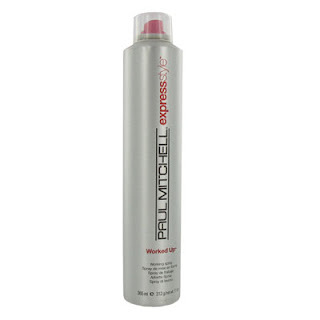 With dry hair, spray on Paul Mitchell ‘Worked Up’ a working hairspray that holds an amazing soft texture, without crunch. Section hair into 3- parts; the top- from above the temples, middle- above the ears and leave the bottom hanging down. Use any basic clips to hold the hair up. I love the Hot Tools 1 1/4” curling iron. It is the perfect size for lasting waves. Take 1 1/2” sections and roll them on the iron AWAY from your face. (It is easier to do on one side than the other, according to which hand you are. I am left handed and so to curl my right side back, I turn the iron upside down to roll away from my face.) Start with your hair in the middle of the section and roll towards your scalp, leaving the ends out and slowly turning the iron to work the hair around, eventually spiraling to your ends. (Do NOT start at bottom and roll up!) Continue this all the way up to the top section, leaving curls just as they are, off the iron. Spray curled hair with a medium hairspray, Kenra 13 is my favorite. 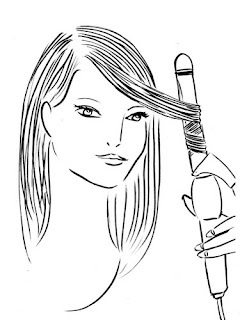 Let hair cool for a couple minutes and then run fingers through in a raking motion from front to back, lifting up a bit at the same time. This will soften the waves making them look more natural and less of a formed spiral. If the top is a little flat, take a backcomb brush, lift a section up and backcomb the underneath towards the scalp to add some lift. 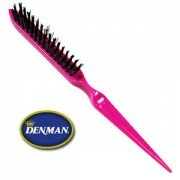 You can soften the top side by lightly grazing the brush, back over the top, smoothing any out of place texture. Play with your part! I love a center part for this style or off-center/side part. 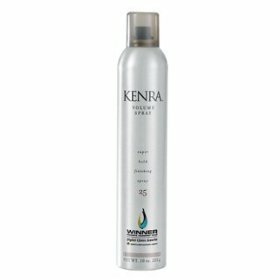 Spray with a strong hold hairspray, Kenra 25 is an amazingly strong spray to keep your style in place throughout the day or evening.